If I’m being honest, moving to Costa Rica wasn’t something I had planned. I wasn’t completely unhappy with my life in New Jersey. My job as a business development manager for a software company was easy enough and I had a 9-to-5 schedule with weekends free. My free-spirited wife Susan was the catalyst behind our move. One day she came home and told me she had quit her job of 25 years as a hotel executive and wanted to move somewhere tropical. Our kids were all grown up, we had very little holding us back…and I figured that maybe we’d have a better life, doing the things we love in year-round tropical weather. Within a few short months, we had sold our home, cashed in some modest investments, packed whatever we could into five suitcases, and boarded a plane to Costa Rica. Today, we live in the Pacific coast town of Tres Rios. Our home is on a mountainside, hidden by lush tropical jungle. We have a faint view of the ocean but the Coranado River can be heard rushing below. We’re only a 10-minute drive from one of the area’s most popular beaches, Playa Ventanas. 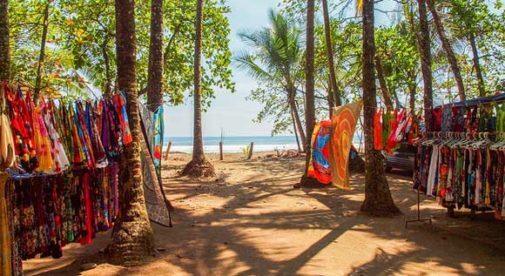 We’re also close to the popular beaches of Dominical, Uvita, and Ojochal. We rent our one-bedroom villa home for less than $400 a month. Our monthly budget ranges between $1,500 and $2,000 and this covers our rent, electricity, water, food, and any trips we might take around the country. In the U.S., my wife and I were poster children for the American dream. On the surface, at least. We lived in a resort town on a golf course with a nice home and cars. But behind the scenes, we hardly spent any time together or with our families and friends. While I blindly enjoyed being a slave to “having more” in the U.S., I now realize the difference in my life. There is no pressure to succeed beyond what is needed to live in Costa Rica. Living in Costa Rica has afforded Susan and I more time together. Instead of meeting up at the end of the day, we now start our day together watching toucans from our balcony while enjoying freshly brewed coffee. Getting together with friends is a weekly occurrence that is planned around the beach, farmer’s markets, pool parties, and restaurants. During the day, I write and do graphic design work online while my wife helps local hotels improve their operations. I’m an avid fisherman and fishing in Costa Rica is quite the experience. I’m now able to fish on a river, from the shores of the ocean and in the deep sea. After nearly two years living here, I’ve found a peace and tranquility that is so elusive in the U.S. Visitors to Costa Rica always comment on the country’s natural untamed beauty and diverse wildlife, all of which is mind-blowing. However, I’ve found that Costa Rica’s most endearing quality is its people. The Ticos are some of the most beautiful, kind-natured people that I have ever met. Most will do anything to help you and you can’t help but admire the happiness they find in family and friends. My one piece of advice for anyone thinking about moving to Costa Rica is do your research. Find out if it’s really the right place for you. And if you do find yourself embarking on a new life in Costa Rica, there is a huge expat community here, made up of people like me, who are here to help with your transition.